FREQUENCY: The incidence is around 1 in 300 births. It is about 4 x more common in boys. PATIENT HISTORY: This stomach is from an infant of 3 months. No other clinical data is recorded. The stomach has been opened to view the mucosal aspect. Note the band-like hypertrophy of the pyloric musculature. In response to the chronic pyloric obstruction the remainder of the stomach has become dilated and hypertrophied. Immediately proximal to the pylorus is a large irregular area of superficial ulceration - (Shaded area in the photograph). Ulceration is rare in an infant of this age and forms an unusual complication of this disorder. Congenital hypertrophic pyloric stenosis is the most common cause of intestinal obstruction in infancy. First-born white males of Northern European ancestry are most commonly affected. There is hypertrophy and hyperplasia of the muscular layers of the pylorus, causing a functional gastric outlet obstruction. The condition presents at 3 to 12 weeks with progressive vomiting, in a previously well infant. The vomiting is non-bile stained and may be projectile i.e. it is more forceful than simple regurgitation. The firm mass the size of an olive may be palpated in the right upper quadrant of the abdomen. 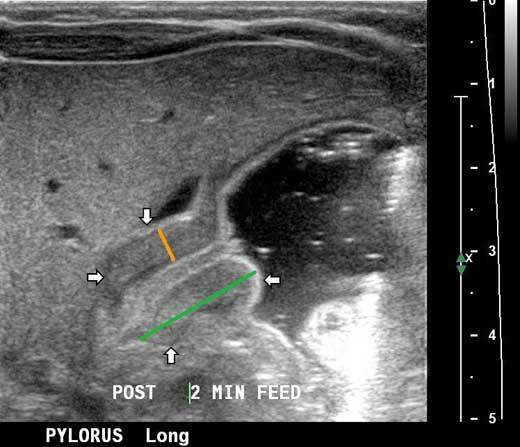 The thickened pyloric muscle is easily seen on ultrasound. If the condition is not recognised, the infant becomes dehydrated and shocked. The cause of congenital hypertrophic pyloric stenosis is poorly understood. It is possibly the result of local neuromuscular incoordination. There is quite a strong familial tendency but no definite pattern of inheritance. After stabilising the child's general condition, congenital pyloric stenosis is treated by pyloromyotomy, where a cut is made through the pyloric muscles down to the submuscosa, so relieving the obstruction. The procedure may be done via laparoscope. The prognosis is very good. This 6 week-old female patient presented with projectile vomiting. The ultrasound shows an enlarged pylorus. The length (green line) was 16mm (upper limit of normal 14mm), and the muscle thickness (orange line) was 4mm (upper limit of normal 3mm). The most telling sign was that no gastric contents were seen to pass through the pylorus at any time during the examination.